Crysis 2, an EA-published game that disappeared from the popular PC gaming service Steam last year, returned today. Peace on Earth between Steam's team at Valve and EA? Not exactly. EA pulled some of its games from Steam Steam pulled some of EA's games last year due to objections about how Steam handled downloadable content, something to do with whether it could be sold through in-game shops or not. A revised Crysis 2: Maximum Edition apparently addresses that, thanks to efforts by the game's creators at the not-owned-by-EA studio Crytek. Hence the return. EA continues to push Origin hard, requiring integration for key PC games like Battlefield 3 Star Wars: The Old Republic. It also appears to remain both unhappy about certain terms of service in Steam while being open to both putting Valve games on Origin and having its games on Steam. Many EA games are on the service. Major internally-developed EA games including Mass Effect 3 and SW:TOR are still not on Steam. 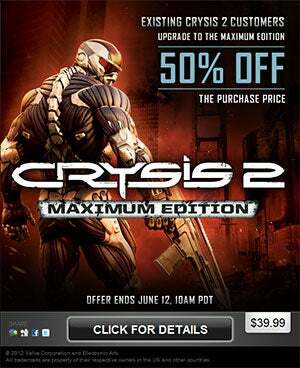 Here's the official EA blurb on Crysis 2: Maximum Edition: "The Crysis 2: Maximum Edition features all the content found in the Crysis 2: Limited Edition plus two previously released DLC packs, Retaliation and Decimation, all for $39.99. The Crysis 2: Maximum Edition provides gamers with 9 additional multiplayer maps, 2 new weapons, bonus XP, weapon skins and attachments, and unique dog tags that were not included in the standard retail package for Crysis 2."